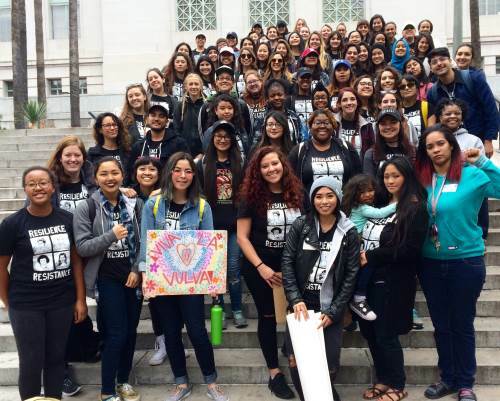 The Women’s Resource Center at San Diego State University strives to provide a vibrant, brave, and inclusive space that educates, empowers, and advocates for women’s rights and issues. The Women’s Resource Center (WRC) endeavors to establish a campus culture that values all women’s intersecting identities and experiences, and acknowledges the diversity of genders in a just environment and changing world. The WRC aims to engage all students in discourse and programs that help create a feminist gender-conscious campus climate and helps to provide the tools and resources necessary to cultivate socially responsible campus and community leadership while enhancing students’ academic, personal, and professional success. The WRC actively engages and utilizes the commitment and expertise of faculty, staff, students, alumni and community members to build a collaborative atmosphere that links the campus with the larger San Diego Community. The Women’s Resource Center serves as a principal resource in providing information, encouragement, and support to women-identified students in an environment that enables feminist activism, and creates campus and community-wide alliances for social justice and inclusive excellence.